Vanishing Arctic ice is the planet’s white flag of surrender. The planet’s last great global ice melt left a benign and balmy climate in which civilization was cradled: the new great melting heralds a grave threat to civilization. But as the polar flag becomes ever more tattered, with holes scorched by hotter ocean waters, humanity pumps ever more globe-warming gases into the air. This ice melting happens very far from most of us, so we do not really think about it. The poles are part of our world and play a very significant role in our lives. 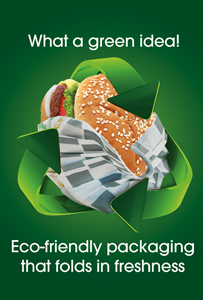 This is why GreenDustries wants to inform you the best we can. Greenland and Antarctica ‘have lost four trillion tons of ice’ in 20 years pushing up sea levels, according to a study that provides the best measure to date of the effect climate change is having on the earth’s biggest ice sheets. This was the most destructive tundra fire at that site for at least 5,000 years. Models built on 60 years of climate and fire data found that even moderate increases in warm-season temperatures in the region dramatically increase the likelihood of such fires. After the Anaktuvuk fire, University of Illinois plant biology professor Feng Sheng Hu sought to answer a simple question: Was this seemingly historic fire an anomaly, or were large fires a regular occurrence in the region? On a trip to Alaska in 2008, Hu chartered a helicopter to the region of the Anaktuvuk fire and collected sediment cores from two affected lakes. He and his colleagues analyzed the distribution of charcoal particles in these cores and used established techniques to determine the approximate ages of different sediment layers. The team found no evidence of a fire of similar scale and intensity in sediments representing roughly 5,000 years at that locale. The researchers then analyzed 60 years of fire, temperature and precipitation records from the Alaskan tundra to determine whether specific climate conditions prevailed in years with significant tundra fires. June through September. (The study team also included researchers from the University of Alaska Fairbanks, Neptune and Company, and the University of Washington. The National Science Foundation and the Joint Fire Science Program supported this study.) With what’s going on, what about the wildlife in the Artic? What about the Polar Bears? Polar bears live in one of the planet’s coldest environments and depend on a thick coat of insulated fur, which covers a warming layer of fat. Fur even grows on the bottom of their paws, which protects against cold surfaces and provides a good grip on ice. The bear’s stark white coat provides camouflage in surrounding snow and ice. But under their fur, polar bears have black skin—the better to soak in the sun’s warming rays. They frequent areas of shifting, cracking ice where seals may surface to breathe air. They also stalk ice edges and breathing holes. If the opportunity presents itself, polar bears will also consume carcasses, such as those of dead whales. These Arctic giants are the masters of their environment and have no natural enemies but mankind and Climate Change”. They will be very soon an “endanger species” because of Climate Change and the Ice Melting. They cannot find food, swim far and drown, or they’re to skinny and cannot feed their babies and become cannibals to survive. 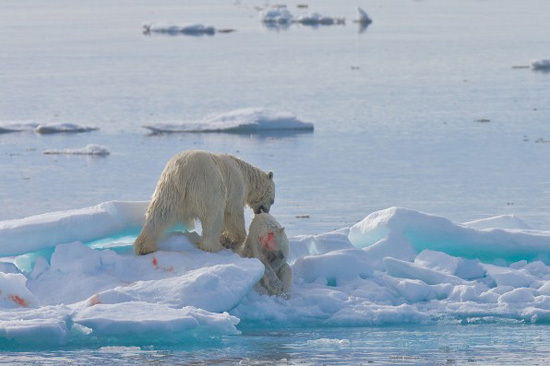 After killing a yearling cub for food in the Norwegian Arctic, an adult male drags the young bear’s body across the ice before stopping to eat it. As temperatures continue to rise and arctic sea ice continues to disappear, it will be increasingly difficult for polar bears to hunt seals. Scientists believe such tragic instances of polar bear cannibalism may become more common as a consequence. “After exploring Wrangel Island in the Russian High Arctic, I was in my cabin on the Heritage Expeditions ship, Professor Khromov, as we headed south toward the Siberian mainland. Suddenly, the voice of an excited Russian crew member blared on the ship’s intercom, “Polar bear! Swimming! Near ship! Port side!” I grabbed my camera and ran out on to the deck. 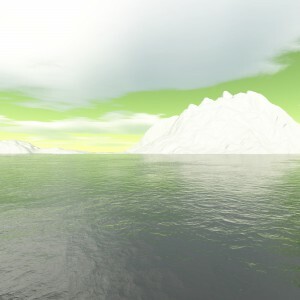 Scanning the sea, I searched for a furry white head among the waves; I found nothing. As the ship continued to plough through the turbulent ocean, I pondered the situation. We were hundreds of kilometers south of the nearest arctic sea ice, which had melted and receded far north towards the central polar basin. It was August 12, about one month before the sea ice would reach its annual minimum extent after the summer melt, but a vast open ocean already separated Wrangel Island from the pack ice. Historically, sea ice remained near Wrangel for most of the year. But climate warming has recently caused the ice to shrink dramatically, and now it’s absent in prime polar bear habitat throughout the Chukchi Sea for several months from mid-summer through late fall. Polar bears need sea ice for all essential aspects of their lives; so why was this bear swimming here? Polar bears travel mostly on sea ice as they traverse their frozen habitat hunting for seals – their primary prey. They are excellent swimmers with impressive endurance and they readily paddle in frigid waters. Nonetheless, they cannot swim indefinitely and will encounter difficulties in stormy seas. Swimming from floe-to-floe in areas of broken ice is easy for them, but attempting to swim very far in rough waters can be disastrous. In 2004, researchers saw four drowned polar bears floating in Alaska’s Beaufort Sea following a storm. Those bears died while attempting to find sea ice, which had receded hundreds of kilometers to the north. The scientists surmised that two-dozen other bears, seen swimming before the storm, also probably perished. In 2008, researchers documented an astonishing 9-day non-stop swim of 687 kilometers by a radio-collared bear who departed from Alaska’s coast and headed north across open ocean to reach the shrinking sea ice. She survived the journey but lost 22% of her body weight and her yearling cub. Over many tens of thousands of years, polar bears evolved to be uniquely well-adapted for a very narrow ecological niche. Polar bears are able to satisfy their enormous energy needs and thrive in the Arctic because they are able to digest and assimilate 84% of the protein and 97% of the fat from their blubbery prey. Polar bears use various hunting techniques to catch their quick-swimming food, but all methods depend on the existence of sea ice. With extraordinarily rare exceptions, polar bears cannot seize their agile prey in the water. “The Arctic summer sea ice is in a death spiral.” Unquestionably, this situation poses a dire threat to polar bears. Over 30 years ago, Ian Stirling initiated long-term research on Canada’s Western Hudson Bay (WHB) population of polar bears to gain a detailed understanding of their biology and ecology. Since then, the decades-long work of Stirling and others has proven climate change is imperiling the bears. To make matters worse, deteriorating sea-ice conditions may also affect polar bears’ reproductive rates by directly impairing their ability to locate one another for breeding. And if, in addition to being endangered by global warming and vanishing sea ice, polar bears are also subjected to increasing human disturbance, killed by hunters and poachers, and exposed to dangerous contamination in their shrinking habitat, they will decline into oblivion even faster. 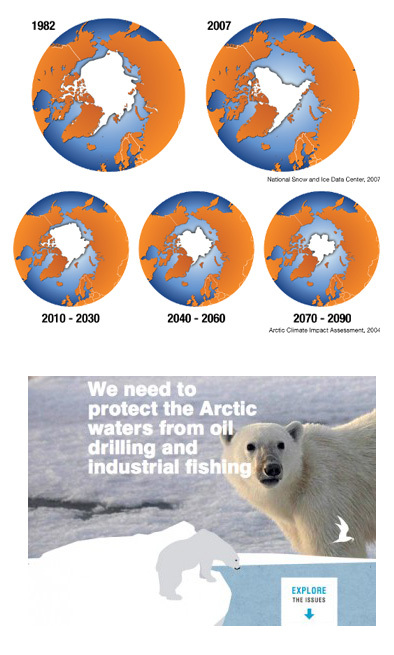 Of particular concern is the active push for oil exploration, production and shipping in many crucial regions of polar bear habitat as the Arctic Ocean becomes increasingly ice-free. “It is obvious that an oil spill would be devastating to polar bears,” says Stirling. “The contamination will almost certainly kill them.” Polar bears have no natural aversion to oil and, in fact, may be dangerously attracted to it. Whether by swimming in oil-covered seas or travelling on oil-soaked ice, they would become contaminated in the event of a spill, and the consequences would be deadly. Once polar bear fur is fouled with oil, Stirling explains, it loses its insulating properties. Shivering bears will then attempt to groom their fur by licking themselves clean, and will ingest the toxic oil. Kidney failure and death will almost invariably follow. Because resources to contain an arctic oil spill are not currently available, and no proven technology exists to clean up oil in icy arctic seas, the danger to polar bears from oil drilling and transport in their habitat is indisputable and significant. 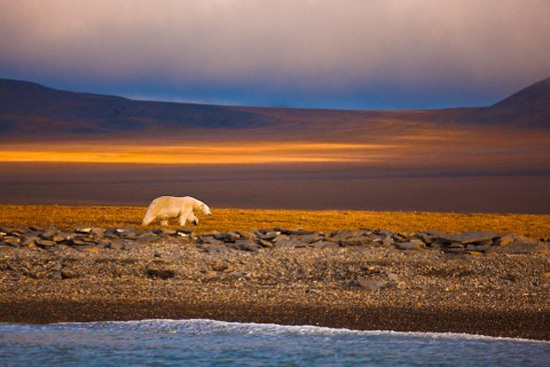 A polar bear wanders along the ice-free shoreline of Wrangel Island in the Russian High Arctic in early August, subsisting on his fat reserves and waiting for sea ice to form again. Although in the past the ice remained near the island all year round, enabling bears to hunt for seals even in late summer, now the ice recedes far away toward the central polar basin for several months during the melt season. Wrangel was once called a “polar bear maternity ward” because several hundred mother bears denned and raised their cubs on the remote island annually. But Nikita Ovsyanikov, a Russian scientist who has been observing the bears for many years, notes that use of Wrangel for maternity denning is declining, apparently as the result of climate change. His data indicate that a maximum of only 60 to 70 females give birth to cubs on the island now, whereas in the early 1990s there were approximately 350 to 400 maternity dens in active use there each year. If humans continue to burn fossil fuels and pump ever- increasing amounts of heat-trapping gases into the air, arctic temperatures will inevitably continue to rise, and sea ice will surely continue to shrivel. Will any polar bears survive anywhere in the wild by the end of this century if we simply carry on with business-as-usual? It appears extremely unlikely. “As the sea ice goes, so goes the polar bear,” says Amstrup. Research by Amstrup and colleagues has shown that if current trends persist, at least two-thirds of the world’s polar bears will vanish within the next 40 years, and the rest are likely to disappear by 2100.